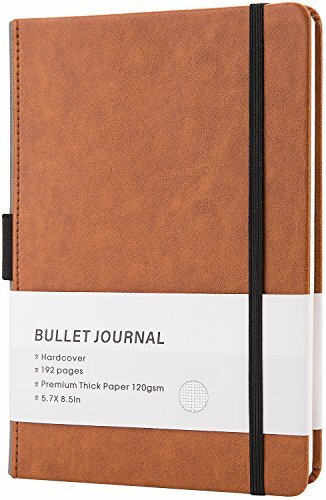 Bullet Journal/Notebook - Dot Grid Hard Cover Notebook, Premium Thick Paper with Fine Inner Pocket, A5 Size(5''x 8.25'') by Lemome at LDP Graphic Design. MPN: LMA5ZHDZBZA01. Hurry! Limited time offer. Offer valid only while supplies last. SMOOTH & ELEGANT LEATHER - Highest quality classic texture hardcover with pen hold and elastic closure; Each journal is opens flat 180°for easy note taking. Inside back cover pocket holds notes, business cards, etc. Elastic band attached to back cover keeps journal closed. Sturdy design ensures your journal will last for years to come. PREMIUM THICK PAPER - 120 gsm soft beige/ creme natural color paper, doesn't reflect light brightly as white paper, it's pleasant and easy on the eyes: smooth to write on, thick enough to avoid bleeding and ghosting, provide you a happy journal experience. MEDIUM SIZE - 5"X8.3", A5, 192 Pages (96 Sheets), Dots are spaced optimally at 5mm (0.2in), great for wide or compact handwriting, 1 RIBBON MARKER ELASTIC BAND makes easy usage. Pocket size of this bullet journal fits any small, medium bag. MULTI-TASK ORGANIZER - Dot journaling is great as travelers notebook, cute & cool personal diary, classic recipe journal, customized habits tracker. Together with stickers it might be the best set for students & school. SATISFACTION GUARANTEE - If you don't love it for any quality reason, Just return it and we'll replace it or send you a refund. Customers satisfaction is our greatest pursuit and high quality is always our goal. If you have any questions about this product by Lemome, contact us by completing and submitting the form below. If you are looking for a specif part number, please include it with your message.